This chapter focuses on the design of rules for apportioning limited groundwater resources among agricultural users. It shows that different (often antagonist) conceptions of desirable water allocation rules co-exist within the agricultural community, reflecting farmers’ differences in terms of economic self-interests, historical background and ethical values. Based on an empirical case study conducted in France, we disentangle the factors which determine the acceptability of alternative groundwater allocation rules by farmers, paying specific attention to the perception of their legitimacy, feasibility and social justice. We show that social justice plays a very significant role in the construction of the acceptability judgment, as already highlighted by a series of Australian studies. 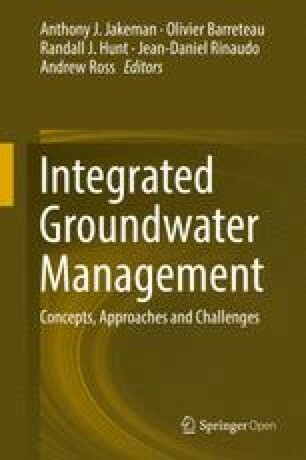 Since the latter part of the twentieth century, individual irrigation based on groundwater has experienced strong development in agriculture worldwide (Chap. 2; Giordano and Villholt 2007). In many countries, including those where groundwater use is now regulated (Australia, Chile, Spain, and Western US States) groundwater use has developed within a non-constraining institutional framework which often resembled a free-access regime. Farmers were granted abstraction licenses which specified a maximum pumping capacity or an area to be irrigated, generally without imposing (or enforcing) any effective constraint in terms of volume. Public agencies in charge of issuing licenses favorably responded to farmers’ demand without having accurate (if any) information, neither on the sustainable yields of the aquifers, nor actual abstractions by farmers. This resulted in groundwater overuse and related problems such as declining water tables, land subsidence, sea water intrusion in coastal aquifers, reduced river flows, springs dry-up and/or ecological deterioration of groundwater dependent ecosystems (Giordano and Villholt 2007, Chap. 2). This chapter focuses on the second stage of this reform process and more specifically on the design of rules for apportioning the available volume of water among users. Not surprisingly, this is a very sensitive and often controversial step, which may impact the whole outcome of the reform process. Different (often antagonist) conceptions of desirable water allocation rules co-exist within the agricultural community, reflecting farmers’ differences in terms of economic self-interests, historical background and ethical values. Crafting a groundwater allocation rule which can be accepted by the greatest possible number of farmers represents a major challenge for water managers. Indeed, a rule that would not be accepted would probably not be complied with, meaning that many farmers would abstract more than the share of water to which they are entitled. This outcome would raise the level of enforcement effort (control and sanction) required from the manager who may not be able to deliver it (public agency or water user association alike) in a context of increasingly limited human and financial resources. It would also result in increased tensions between the farming community and the administration. One strategy for water managers to increase reform acceptability consists of performing an initial analysis of how stakeholders perceive different allocation rules, using hypothetical scenarios, before initiating any negotiation on groundwater allocation. The aim is to disentangle the factors which determine the acceptability of the different scenarios, paying specific attention to the perception of their legitimacy, feasibility and social justice (see also Chap. 10). Social justice plays a very significant role in the construction of the acceptability judgment, as highlighted by a series of Australian studies in the water sector (Syme and Nancarrow 1997; Nancarrow et al. 1998; Gross 2011). These studies suggest that an allocation rule is more likely to be accepted, together with the corresponding economic losses it implies, if users consider that the rule leads to an equitable apportionment of water resources (distributive justice) and if they consider the choice of the rule results from a fair decision making process (procedural justice) . Investigations conducted by Syme and Nancarrow have highlighted that water users construct their own definition of fairness by articulating different lay philosophies of justice. The resulting perception of what a “fair” allocation is thus varies in space and time. Consequently, since there is no dominant definition of justice, the way the notion is constructed should be assessed on a case by case basis, considering the history, economy, social organization and the prevailing ethical values of each local society as well as users’ heterogeneity in terms of social preferences. The research presented in this chapter contributes to this field of investigation through an empirical case study conducted in five French groundwater basins. Building on the results of the Australian studies, it goes further by attempting to articulate the notions of acceptability and social justice, the latter being considered as an important, but not the sole, determinant of acceptability. The study focuses on water allocation within the agricultural sector, while most previous studies have dealt with inter-sectoral allocation. The method chosen involves eliciting farmers’ visions in regard to nine water allocation scenarios, each of which reposes one (or a combination) of a theoretical concept of social justice. The consultation, organized through semi-structured interviews, involved 76 farmers selected within the five French groundwater basins. From an operational perspective, this chapter proposes a method that is both original and readily implemented to evaluate a priori the acceptability of the different water allocation rules. The chapter is organized as follows. It begins with a presentation of various policy approaches implemented worldwide to manage water abstraction in over-used or over-allocated groundwater basins, clarifying the underlying principle of justice. It then describes the French context, the method adopted and the case studies. Subsequently, we present the results obtained (perception of the nine scenarios), before discussing policy implications of the study. In many countries, policies consistently state that water resources need to be allocated with equity, without clearly defining how equity can actually be measured and how an equitable and fair allocation can be achieved in practice (Movik 2014; Roa-García 2014). The notion of distributive justice can indeed refer to very different interpretations and philosophical principles (Lamont and Favor 2012) such as prior appropriation or entitlement (Nozic 1974), strict egalitarianism (Nielsen 1979), the difference principle and equality of opportunity (Rawls 1971), the desert-based principle (Sadurski 1985), welfare based principles (Mill 1940) and libertarian principles (Nozic 1974). According to the prior appropriation conception of justice, people who first use the resource are entitled to keep it (entitlements) provided they do not violate the rights of others. Strict egalitarianism assumes that all members of the society should be given access to the same amount of resources because “people are morally equal, and that equality in material goods and services is the best way to give effect to this moral ideal” (Lamont and Favor 2012). The difference principle assumes that inequalities in the distribution of resources are acceptable if they improve the situation of the worst-off in the society, whereas the “equality of opportunity” principle aims at attenuating inherited sources of inequalities (gender, race). The desert principle assumes that resources should be allocated considering the socially valuable efforts (i.e. leading to the production of goods and services desired by others) made by each individual. Welfare-based principles of justice assume that the allocation of resources should maximize social welfare, defined as the sum of individual satisfied preferences, and frequently interpreted in terms of economic wealth (utilitarian approach). Finally, libertarian theories assume that the allocation of resources resulting from market mechanisms is just because it results from transactions which are just in themselves; in that conception, no specific distributive pattern is required for justice, what matters is that acquisition and exchange conditions be right. In practice, policy approaches which have been implemented to manage over-allocated groundwater systems frequently rely on a combination of several of the justice principles listed above. Based on an analysis of allocation policies implemented worldwide, we identify five archetypal policy approaches which we consider representative of the diversity of practices worldwide. The first policy approach is based on the prior appropriation doctrine, based on a “first in time, first in right” philosophy. To align global abstraction with sustainable yield, the regulator curtails volumes granted to junior users while senior users do not suffer any (or a smaller) reduction. This approach implicitly considers that access to groundwater is subject to a priority order according to chronological possession. It considers individual water entitlements as property rights, valid in perpetuity, and which can be sold and purchased like any other property. Examples of such allocation policies can be found in Western States of the USA (Chap. 22; Blomquist et al. 2004; Schlager 2006). An alternative policy approach consists of imposing on all users the same reduction in percentage of the volume they have been using during a recent reference period. It relies on two principles: an egalitarian principle, which refers to treating people identically (same cut-back in percentage), without regard to historical, social and economic circumstances; and an implicit recognition of the right to continue pre-existing use (grandfathering). The corollary is that water entitlement can be reduced when the volume specified in the license is not fully used (sleeping allocations). This reduction is undertaken without offering any financial compensation as there was no beneficial use of the corresponding volume. Policies reflecting this approach have been implemented in several Australian States (NRMSC 2002) and in the UK but also in some Water districts in the Western USA (e.g. California) who apply a “use it or lose it” condition. It remains attractive to policy makers in that it does not move too far away from the status quo, thereby minimizing political opposition to the reform and risks of social unrest during the implementation phase. Note that similar approaches have been implemented to allocate catch quotas in fisheries (Presser 1994; Khalilian et al. 2010). A third policy approach embodies calculating the volume of water that would be theoretically needed by each farmer, assuming efficient irrigation technologies and considering the crops cultivated during a reference period. This theoretical volume then constitutes an individual reference to which the regulator applies an across-the-board cut-back to ensure sustainable use of the aquifer. Efficient farmers will thus have smaller cut-backs in allocation than others. This approach reflects a philosophy of justice based on the principle of desert or merit (those who made efforts to improve efficiency being rewarded while others are disadvantaged) and efficiency. It has been applied since the mid 1990s in a limited number of French groundwater basins. In the three previous approaches, actual users benefit from an historical rent, whereas new users are denied access to the resource. This may result is inefficient water allocation if historical users have a low water marginal productivity as compared to new users. To solve that problem, a fundamentally different approach can be adopted to adjust allocation in over-allocated groundwater systems. It consists of cancelling all existing licenses before reallocating the available volume of water using an auction mechanism. This allows new users to enter the system while removing inefficient users. The underlying philosophy of justice is that users who maximize the added value of water, and who can pay for it, deserve using it (economic efficiency). This approach has not been used in practice, except in some Australian basins, where unused volumes of water are auctioned. A fifth and last approach applies different allocation cut-back rates to users, depending on inherited historical equities that result in present inequitable opportunities. Reductions or no cut-backs will be imposed on farmers who have received limited water allocation due to late arrival in the zone, to inequitable past policies or to farmers affected by long lasting unfavorable market conditions. The objective is to protect economically fragile farmers who could possibly be ruled out of business with an egalitarian or an efficiency based approach, following Rawls’ difference principle. In some French basins for instance, the regulator has decided to exempt small cattle breeders and certain fruit producers from seasonal allocation cut-backs, considering their high exposure to market risks. Farmers entitled with small water allocations are also exempted from cut-backs (France, Australia). The objective can also be to redress historical inequities or reduce poverty, as practiced for instance in South-Africa (Movik 2014; van Koppen and Schneiner 2014). The five approaches described above represent archetypal policy options for managing over-allocated groundwater systems. They certainly do not represent off-the-shelf solutions that would be directly applicable in a different context. However, because they illustrate the range of possible policy options, they can be used as hypothetical scenarios for engaging a debate between stakeholders. The virtue of using such scenarios as educational material is that it compels stakeholders to clarify why they support or reject a given policy option. This debate is expected to make explicit the diversity of principles advocated within the community (in particular social justice principles) for guiding the choice of a water allocation rule. While some of the principles enunciated will be incompatible, others can be combined to construct hybrid policy scenarios likely to be accepted by the greatest number. Critical scenario analysis is also expected to highlight how each individual articulates different principles of justice to reconcile their own self-interests and philosophical values. Understanding the complexity of individual constructions of a sense of justice is seen as a key asset for the regulator seeking to engage stakeholders in a negotiation over water allocation rules. This is now illustrated through the French case study. The French situation illustrates the challenges related to the shift from an open access to a regulated groundwater abstraction regime, as described in the introduction. In France, the area irrigated increased from 1.8 to 2.7 million hectares between 1988 and 2000, mainly through the development of groundwater abstraction through private individual wells (Loubier et al. 2013). Until the mid-1990s, farmers were almost systematically granted groundwater use licenses which did not impose any ceiling on abstraction. In 1992, a new Water Act laid the foundations of a groundwater abstraction regulation regime, by imposing metering of all water uses and creating groundwater safeguard zones where government agencies could refuse granting new licenses. More sophisticated regulation regimes were experimentally introduced in a dozen basins, consisting of “capping” total water abstraction and assigning individual quotas (volume per year) to each farmer. The 2006 Water Act generalized this regulation regime to all basins characterized by over-abstraction. In these basins, hydro-geological studies were conducted to assess a sustainable yield. Government agencies calculated an available volume of water and apportioned it between sectors, priority being given to urban supply, industry then agriculture. The volume allocated to agriculture was then officially attributed to newly established Groundwater Users’ Associations (GWUA- Organisme Unique de Gestion Collective in French). These Associations are made responsible for apportioning it among farmers, crafting their own rules for defining individual water allocation . Given the limited resources they have to enforce these rules, they are concerned about identifying options that are more likely to be accepted and complied with by farmers. The empirical study presented in this chapter was conducted in this context. Its first objective was to design and test a methodology that could be used by GWUAs to assess the perception of various hypothetical water allocation rules, prior to engaging stakeholders in a negotiation. The second objective consisted in checking if there were any – or a limited number of – dominant conceptions of social justice within the French farming community, which could be used to define a French water allocation ‘doctrine’, potentially usable by all GWUAs. The methodology of this research comprises four stages. The first involves defining water sharing rules scenarios, each one being based on one (or a combination of) concepts of justice, in line with the archetypal approaches described above. Scenarios were adapted to the French context and presented in the form of a brief text which was sent to the farmers in advance. The second stage entailed discussing these scenarios with farmers, through interviews conducted in five different groundwater basins (Fig. 11.1), and selected based on two criteria: dependency on irrigation from groundwater; and management of water scarcity. Face-to face interviews were conducted where possible (30 interviews) but some had to be made by telephone for practical considerations (17). Discussions were tape recorded to allow subsequent detailed analysis. Twenty-nine other farmers who were contesting the legitimacy of the reform process refused to answer the questionnaire. They however all explained their viewpoint and their arguments were subsequently analyzed. For each scenario, the individual was asked to explain why they felt that the scenario was acceptable or not, and secondly if and why they would consider it as fair and equitable. At the end of the interview, the preferred scenario, or a combination of several preferential scenarios, was to be indicated. The third stage comprised a qualitative analysis of the discourse of participants and a quantitative analysis of their answers to the questionnaire. The arguments put forward by the farmers were re-transcribed word for word and used as a starting point for a qualitative analysis of the principles underlying the various visions of social justice in the agricultural community. The fourth stage was devoted to presenting the results to farmers to obtain a validation of our analysis and additional feedback. This was undertaken through organizing a meeting in each of the case study areas and disseminating a 4-page synthesis of the results to all interviewed farmers. Nine allocation rule scenarios were used to support discussions with farmers during the interviews. Each one is implicitly based on one or several philosophies of justice, as indicated in Table 11.1 below. Two main groups of scenarios are differentiated: those of the first group all assume that only historical users can receive an allocation; whereas the second group considers that a fair allocation should provide all farmers with the possibility to access the resource, independently of historical circumstances. ❶ The allocation is proportional to past abstraction (last 5 years average). This methodology is partly inspired from Syme and Nancarrow’s studies in Western Australia who ask their respondents to assess a number of prominent philosophical statements (Syme and Nancarrow 1996, 1997) or water management scenarios (Nancarrow et al. 1998). Note that farmers were only provided with a detailed description of the first column of Table 11.1, expressed in lay terms. A first significant result is that nearly 40 % of the farmers contacted refused to evaluate the scenarios. All of them justified their positions, using several arguments which are briefly presented hereafter. First, farmers contest the legitimacy of the reform on several grounds. They challenge the reality of water scarcity and the subsequent need for establishing a rationing system. Based on their own observations, they believe that water is more abundant in their area than the experts claim, and that there is no need to reduce abstraction. They also challenge the legitimacy of the volumes of water devoted to the environment (at the expense of agriculture) and/or consider that society should subsidize the construction of new resources (dams, hillside storage reservoir) to compensate for rationing groundwater use for farming. The farmers also refute the relevance of a system of individual volumetric quotas on the grounds that it introduces a rigidity that hinders their freedom to adapt their production strategy to a changing economic context. Moreover, they consider cut-backs as a violation of property rights, considering that historical use generated vested rights. Overall, these farmers consider that participating in the survey and expressing their opinion on scenarios would mean that they recognize the existence of the problem, which is not the case. Second, some of these respondents refused to participate in the survey as they considered the research team had no legitimacy to discuss these issues, since we were not mandated by an institution defending farmers’ interests. There was a general fear that the conclusions of the survey be used against them, to justify decisions already taken, leading them to refuse to participate. These types of reactions raise the issue of procedural justice. Last but not least, some farmers refused to express an opinion on the scenarios presented because it involved too distant a timeframe (difficulty in adopting a prospective stance). Overall, opposition was expressed in a manner that was radical but well justified. Despite this refusal to discuss the scenarios, the farmers took time to consider and make explicit their vision, showing that they adhere to being stakeholders reflecting on water management, and wish to extend the field of possibilities. A majority of the scenarios are the subject of highly contrasting opinions, and they are considered as acceptable by between 40 % and 60 % of the participants (Fig. 11.2). However, the two scenarios that compensate natural inequalities (allocation according to soil or access to surface water) received a higher approval rate of 77 % and 70 %, respectively. Conversely, the rationales inspired from Anglo-Saxon models received more modest support from the panel: 35 % (prior appropriation) and 4 % (sold at auction). Figure 11.2 allows the results to be compared according to the case studies. Opinions converge for the following scenarios: “sold at auction,” “allocation according to seniority,” “according to pumping capacity” and “according to access to surface water”. For the other scenarios, opinions differ widely. These disparities show that, in order to be acceptable, a solution must be adapted to the local context. The new French water law (2006) position of delegating the calculation of quotas to Groundwater Water Users’ Associations, operating at the aquifer level would, in our opinion, promote the acceptability of such a measure. Through these results, we see that the preferred solution is often the one that disturbs the existing order as little as possible. The criteria that should be taken into account relate to the region’s specific characteristics in order to correct natural inequalities amongst irrigators (soil diversity, access to surface water), while at the same time recognizing the farmers’ needs (reflected by pumping capacity and past consumption). Criteria relative to economic efficiency (protection of special crops, markets) or protection for the most vulnerable users (digressive allocation) trigger more reticence and strongly polarize the stances taken by farmers. Excluding certain irrigators, whether on the strength of a financial criterion (sold at auction) or seniority, resulted in a systematic refusal on the part of the irrigators. 11.4.3 The Determinants of Acceptability: Justice Matters but Not Only! The detailed analysis of tape recorded interviews highlighted that farmers form their judgment of acceptability by articulating four main categories of arguments: ethical considerations, including those related to justice; implementation feasibility of the scenario; risks associated with the scenario; and unintended side effects. These four categories were spontaneously advocated by farmers, although they were initially asked to comment on the justice dimension only. Most of the arguments enunciated by farmers during the interviews reflect ethical considerations and are related to social and philosophical values on which the scenarios are based. For instance, the auction scenario provokes strong reticence on ethical grounds due to rejection of the monetization of water (“water is not an economic good”). The “digressive” scenario elicits reactions that are either favorable in reference to the solidarity principle or unfavorable when the scenario is equated with the logic of assistantship or charity. Certain farmers worry that scenarios might give rise to new inequalities (past consumption would penalize farmers who had already adopted water conservation practices), or would reinforce existing inequalities (according to the seniority of the irrigation, since younger farmers are still in the process of reimbursing loans). On the other hand, the soils scenario came across as liable to legitimately attenuate a natural inequality already suffered. A second category of argument relates to the feasibility of implementation. A scenario may be accepted for its underlying ethical principle and yet be invalidated because its operational implementation is thought to be too costly or too complex. This can be illustrated by the scenario suggesting varying allocation according to soil differences; while this scenario was virtually always validated in principle, it was often met with skepticism as to its implementation (lengthy and conflict-ridden negotiations for classifying land parcels, in particular where the soil is highly heterogeneous within short distances). Many farmers were also concerned by the prospect of risk allocation rules being misused. They refer to the possibility that unexpected opportunistic behaviors appear, that rules be abused during their implementation phase, diverting them from their initial objective. This dimension is brought up spontaneously, probably because of many experiences where similar agricultural policy tools missed their mark (e.g. allocation of milk production quotas). Thus, an allocation that varies digressively according to surface area, and supposed to encourage small farms, would spur large enterprises to break up into a host of small entities. Similarly, the decision to grant larger allocation to high added value crops could encourage farmers to increase the planted area of such crops just to obtain a greater allocation which they would in reality use largely for other crops. The fourth category of arguments relates to the unintended consequences that allocation rules might have on farms, the structure of farming systems, or the regional economy as a whole. For example, many farmers think that the digressive scenario would result in decreasing the region’s agricultural performance, as the most competitive farms would be handicapped by reduced allocation. Similarly, selling at auction would encourage hyper-specialization in certain crops, removing from business small diversified farmers who play a key role in maintaining an economic activity in rural areas. Giving priority to high added value crops (vegetable, fruits and certified seeds) would provide incentives for farmers to increase the area under such crops at the expense of traditional production, impacting the regional industry. By introducing a territorial dimension in their analysis, farmers show that the evaluation of water allocation policies should be embedded in a wider context, giving ample thought to the agricultural development model sought for the region. This typology of arguments is useful to disentangle motivations underlying the level of acceptance of our nine scenarios, as depicted in Fig. 11.2. Overall, we see that the ethical dimension is essential, since the scenarios that give rise to a favorable ethical judgment receive strong support, and conversely. However, the diversity of moral principles does not, alone, account for the large variety of preferences. Implementation difficulties are widely cited as well as the risk of seeing new unjust inequalities arise through abuses, and unintended developments in the system. In our interviews, the farmers did not cite a theory or ideal of justice to validate or invalidate the different scenarios. The first reaction was affective in nature, with a very vigorous rejection, for example, for sale at auction, which sparked shock or anger. Sometimes, it was even hard to get beyond this affective relationship, because it was too strong and hard to justify: “I don’t know how to explain it to you, but this scenario, I intuitively feel it will not work” (farmer 41). We thus sought to understand how this sentiment of justice or injustice forms, that prompts farmers to validate or invalidate the proposed scenarios. We noticed that the statements were underlain by various rationales, some of which conformed with the current notion of social justice, and others not. We have accordingly established a typology of ethical stances, or rationales, into which we have placed the 47 irrigators. To assign the farmers unambiguously to one of the rationales, we based our judgment on their reasoning in regard to the scenarios, performing a qualitative (somehow subjective) classification of the salient aspects of what they had to say (based on the material collected through interviews, we were not able to clearly define the rationale of 5 of the 47 farmers). The farmers are distributed relatively uniformly, with each category containing between five and ten individuals (Fig. 11.3). Each of the rationales is described below and illustrated, when possible, with selected farmers’ discourse quotations. “In an emergency situation, irrigation of cereals should be reduced so as to irrigate crops produced under contract for the industry… The priority is to guarantee crops with a high added value ” (farmer 38). These farmers believe that water should be allocated in such a way as to maximize its economic value and protect the security of irrigators. The scarcer water is, the greater its value; it is therefore logical to allocate it to crops that generate the highest revenue. Note that this stance is not only defended by the most efficient producers. Some farmers are willing to sacrifice personal earnings to increase social welfare. Farmers of this group came out strongly in favor of scenario “priority to special crops” (❺). Yet they do set an ethical barrier to this principle, since very few of them accepted allocation via sale at auction (❾). Most farmers in this group rejected the “digressive allocation” scenario (❹), considering it as being “too social”. “I don’t like the idea of differentiating between Whites and Blacks, little and big guys” (farmer 28). In a context of restriction, these farmers associate justice with equality of treatment. “What is fairest, is to destabilize the economic system as little as possible with restrictions, it’s better to apply the same restriction coefficient to everyone” (farmer 28), with the twofold advantage of creating no new inequalities and being easy to implement. The allocation scenarios that propose a single coefficient of restriction (❶❾❹) were the ones that received strong support. Conversely, scenarios implying differential treatment are systematically rejected: sale at auction (❾), allocation according to seniority (❷) and digressive allocation (❹) all received 100 % negative opinions. However, a majority in this group validate the principle of differentiation according to soil (❻), probably motivated by an agronomical rationale rather than social justice consideration. “I’m not a socialist, but I am sensitive to social issues. Everyone has to make an effort, but according to what he can. Nor should there be too great distortions, everyone has got to live” (farmer 17). For these farmers, the level of effort (in terms of allocation cut-back) should be differentiated according to the characteristics and situations in terms of opportunities and difficulties of different farm types. This comes down to accepting positive discrimination as a moral principle of justice. The allocation policy for the water resource is thus similar to a mechanism of social redistribution (references to unemployment insurance, the pension system, the right to housing). Applying a uniform coefficient of restriction would confirm existing inequalities or even give rise to new ones. “A young farmer setting-up a new farm without initial capital is disadvantaged as compared to one inheriting from a family farm, he should therefore not be subjected to further prejudice” (farmer 11). This group widely approves the digressive allocation scenario (❹) and the allocation differentiated by soil types (❻). Protection of special crops (❺) is rejected, albeit differentiated. This system does not benefit the underprivileged. “It’s hard to come to an agreement, but we’ve no choice. In the 1960s, they [the European Common Agricultural Policy] forced us to be individualistic, but there’s no other way out for us but to reason collectively” (farmer 45). For this group of farmers, what matters is more the process leading to the choice of an allocation rule than the outcome in itself. In other words, this group is more concerned with procedural than distributive justice: if the decision making process is fair, final decisions on over-allocation will be accepted. They consider that the definition of a water allocation policy must not be reduced to the definition of individual water quotas, based on a negotiation where everyone defends their own individual or corporate interests. The design of water allocation rules should instead be taken as an opportunity for a societal debate on the type of agriculture to be promoted. Water allocation policy is a lever for a territorial and agricultural development policy. Farmers of this group consider that a user does not own water resources but merely is a custodian. These respondents defend the view, developed by Elinor Ostrom (1990), of a communitarian management of a common property, which can oppose management by the market or by the State effectively. “I don’t like what you’re suggesting: water management isn’t a social affair, it’s an agronomic affair” (farmer 20). This group considers that irrigation is a farming practice, an act concurring with the production of crops like sowing, pruning or harvesting. It is determined by agronomic parameters (the plant’s needs, the soil, the rainfall, etc.). Water allocation should be following the same rationale, i.e. be based on the same parameters; any other rationale constitutes an incursion of social and economic issues into a domain of technical agricultural efficiency. These farmers came out strongly in favor of allocation according to soil type (❻), according to past consumption (❶), and the pumping capacity (❸) which they consider good indicators of crop water requirements. The other scenarios, responding to a social or economic line of rationale, are deemed poorly adapted and far removed from the objective of promoting an efficient use of water. These farmers call into question how we have formulated the terms of the debate, by presupposing that water allocation involves issues of social justice. “Your questionnaire is doomed to failure, everyone will defend the scenario that suits him best” (farmer 10). These farmers examine the proposed scenarios in the light of the situation on their own farm. The scenarios are evaluated one by one, according to the advantages and threats it presents for the respondent’s own interests. “I am one of the first farmers who developed irrigation in the region, I’m going to speak up for my own” (farmer 22). This echoes some situations reported in Australian studies: “the forces of self-interest among water users become pre-eminent, and public involvement merely becomes a game of each stakeholder presenting his or her interest in the most favorable light possible” (Syme et al. 1999). No scenario emerges clearly from this group as the choice reflects individual heterogeneous situations. However, scenarios based on seniority, which is generally rejected by all farmers, is widely approved in this group (which confirms the rationale of preserving what has been gained). Assigning each farmer to only one of the rationales described above is however too simplistic. Indeed if some respondents do clearly fall into one type or another, most borrow arguments, successively or simultaneously, pertaining to different stances. When they have come to perceive a modality of allocation as being too far removed from their position on one or another of these “poles”, they came forward with an argument to strengthen this “frustrated pole”. Thus, farmers positioning with respect to the different rationales is not binary (opposition/adhesion), but rather suggests a gradation in terms of acceptance. Farmers can mobilize two, three or even four principles. They do not oppose the principles with each other, but rather combine them to make up a corpus of values that they mobilize successively. It is accordingly by this composition, this ongoing compromise, that the sentiment of justice is formed. This chapter proposes a method for evaluating the perception of justice and the acceptability of water allocation rules in over-used/over-allocated groundwater basins. We have endeavored to identify the factors determining acceptability for different principles of initial groundwater allocation. A first phase of this work was the design of contrasted scenarios depicting concrete rules for sharing the resource. These rules were inspired by an analysis of existing groundwater allocation practices in a selected number of countries and by a review of universal philosophies of justice. These scenarios were submitted to the scrutiny of 76 farmers from five French groundwater basins. The contribution of this study to the existing literature on justice and water allocation is threefold. First, it complements existing Australian studies by providing empirical material relating justice issues to groundwater allocation problems in a European context. Moreover, the chapter focuses on the issue of water allocation within the farming community, whereas most of the existing literature deals with allocation between productive uses and the environment (a notable exception is (Nancarrow et al. 1998)). Our study confirms earlier findings that justice issues can be readily articulated by the farming community. We confirm that self-interest is only one of many different perspectives in the water allocation debate. We also invalidate our initial assumption on the existence of a limited number of dominant conceptions of social justice in the farming community, by showing that many different rationales coexist. The ways these principles are combined is likely to vary according to aquifer characteristics, land use and community culture (Syme and Nancarrow 2006). Second, we highlight that acceptability of new water allocation rules is not only determined by how stakeholders perceive these rules in terms of distributive justice. Farmers’ judgment is equally influenced by their perception of the legitimacy of the policy in which the question of allocation rule is embedded. Their arguments in that regard can be interpreted using the framework proposed by Suchman who distinguishes pragmatic, moral and cognitive legitimacy (Suchman 1995). Pragmatic legitimacy is determined by how farmers see their own activities and self-interest being impacted by the policy reform. Pragmatic legitimacy exists when farmers perceive that groundwater depletion will affect their self-interest in the long term, making abstraction regulation desirable. This was not the case in our French case studies where farmers only perceive the short term negative impacts on their income of the proposed regulation policy. Moral legitimacy refers to the normative judgment on whether the objectives of water policy promote social welfare, in line with moral values of a society. In that respect, French farmers challenge, on macro-economic grounds, the priority given to environmental issues over agricultural production. They also challenge the way the reform is implemented, with insufficient participation of stakeholders (“we know how to manage groundwater, we won’t be dictated a solution by a bureaucrat looking at this from his desk”: farmer 54) and the use of irrelevant policy models considered as universal by the administration (“they [government agencies] want to use the same model from Belfort [Swiss border of the Rhône river basin] to the Italian border, in situations which have nothing in common”; farmer 48). Finally, cognitive legitimacy is granted when the problem justifying a policy, the objectives and the means deployed to achieve them are understandable by concerned stakeholders. As explained in the result section, there was a clear lack of cognitive legitimacy in our French case studies, since many farmers were challenging the water scarcity assumption and refusing experts’ evaluation of aquifer sustainable yield. Our empirical results also show that acceptability of water allocation rules is also determined by their perceived implementation feasibility. Farmers make a very pragmatic evaluation of the difficulties that may arise with different allocation rules in terms of information acquisition and sharing, cost and complexity of operational functioning of the system, associated risks of conflicts, occurrence of deviant behaviors and unintended side-effect impacts. Overall, our empirical findings show that, when evaluating the different scenarios, farmers can alternatively use arguments related to social justice, legitimacy and implementation feasibility, in addition to self-interest considerations. Several policy recommendations can be derived from this empirical study, applying to the French context but also to other similar European contexts where groundwater abstraction regimes are currently being reformed. First, there is a need to strengthen the cognitive and moral legitimacy of the groundwater abstraction policy reform before engaging stakeholders in a discussion of allocation rules. Stakeholders must first be convinced that a problem exists before discussing how to solve it. Government agencies and locally established GWUAs should ensure that stakeholders have a shared understanding of the groundwater situation, the extent of the overexploitation problem, of how sustainable yield was calculated and of the underlying trade-off made between environmental and economic objectives. Closing the gap between scientific experts’ knowledge and farmers’ lay knowledge is a prerequisite to engage farmers in a debate over how to share a limited resource among themselves. Second, GWUA must also play a very proactive role in bringing out different viewpoints and perspectives held by farmers on distributive justice issues. Without a specific effort in that direction, there is a risk of seeing the debate play out not on the grounds of social justice, but rather on those of other dimensions of acceptability, and that the compromise on principles of justice give way to a balance of power. Such a shift occurred when fishing quotas were set in England (Gray et al. 2011). The authors showed that what were deemed to be the fairest modes of calculation were not the ones that were actually chosen, but rather those that guaranteed the sector’s stability and reflected the balance of power amongst the players. The third implication is that the discussion over allocation rules should be embedded into a broader evaluation of alternative agricultural development policies at the groundwater basin level. Discussing intra-agriculture water allocation rules brings farmers to raise the question of what ideal the agricultural community should endeavor to achieve, for which the quotas policy would be one of the levers of action. Water allocation is clearly perceived by farmers as one of the many policy tools that can be used to shape future agricultural developments. It therefore can’t be discussed in isolation, without considering the other levers over agricultural development. Fourth, there is an overall social preference for allocation rule scenarios that compensate natural inequalities (allocation according to soil or access to surface water). Conversely, the rationales inspired from Anglo-Saxon models, including prior appropriation and auctioning are far less accepted. Lay philosophies of French farmers do not seem compatible with the current trend towards market driven approaches which are increasingly promoted at the European level (Commission 2012). From a methodological perspective, the study also demonstrates the relevance of using scenarios to help farmers in presenting and justifying their own vision, the principles they want to promote, the technical approaches they consider feasible or not, and to communicate this vision with each other. In addition to facilitating mutual understanding of existing visions, scenarios are likely to help farmers involved in the negotiation over allocation rules to identify a limited set of principles on which they want to base their allocation rule. Scenarios then provide building blocks that can be combined to construct a rule that can be considered as just by the largest number. The authors wish to thank the Rhône Mediterranean and Corsica Water Agency for the financial support provided for this research project (SIMGDES project). The paper has been prepared with the financial support of BRGM research program 30 (Environmental and Risk economics). We also thank Marian Patrick and Geoff Syme for comments on an earlier version of this chapter.